In 1926, Alfred and Matilda Wilson acquired a special painting to decorate the 110-room home they were constructing on their Meadow Brook Farms estate. 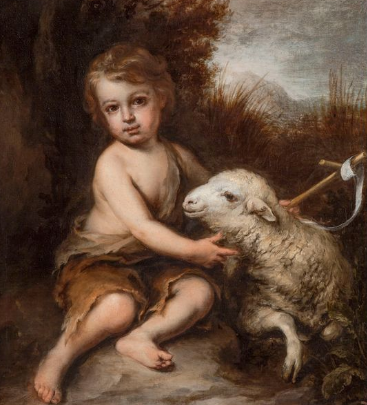 ”Infant St. John the Baptist in the Wilderness,” by Bartolome Esteban Murillo would hang at Meadow Brook Hall until 2013, when it received press after being “discovered” by a curator at the DIA after being out of the public eye for 90 years. The painting and its frame were conserved by the Detroit Institute of Arts in exchange for a five-year loan to its illustrious European Arts gallery. Madelyn Rzadkowolski, curator of Meadow Brook Hall, will discuss the past and future of the painting, from its journey from a monastery to a great English home to being the centerpiece of education and collaboration between the Detroit Institute of Arts, Meadow Brook Hall and Oakland University. August 13, 2018, 7 p.m. to 8:30 p.m.
Reservations are $15 per person and are required. To make a reservation, please click here.